Five Rivers MetroParks lakes, ponds and rivers are rich in fish life. All members of the family, young and old, can find a place to fish for recreation, relaxation or food. Whether you're fishing from the deck of a bass boat, paddling a fishing kayak down a meandering stream, wading the riffles of a babbling creek or sitting in the shade on the bank of a quiet pond, there is a place for you in a MetroPark. Carriage Hill’s ADA accessible boardwalk and fishing pier at Cedar Lake is located adjacent to ample parking, an ADA restroom, and potable water. Several crappies weighing more than 1.5 lbs. have been captured in Cedar Lake, and sunfish in the 6- to 9-inch range are also abundant. Argonne Lake at Possum Creek is a great location for a family day out. Visit the farm animals and then spend some time fishing at the lake free-of-charge and without a license. There are three fishing ponds and a wildlife pond that offer many great fishing experiences. The fishing ponds are stocked with catfish during the summer and trout during the winter. Check for posted releases and regulations. Fishing ponds open 10 PM-2 AM, Fri. and Sat. nights from Memorial Day weekend – Labor Day, for fishing only. Fishing without a license is permitted at Lake George, at the southern end of Twin Creek MetroPark, located at the former Camp Hook Boy Scout facility, donated in 1926 by Charles Hook of ARMCO Steel. The waterfront of the camp was later named Lake George after Charles’ son, George Verity Hook. This pond is ADA accessible with a fishing pier. Catch and release only here. Eastwood Lake in Eastwood MetroPark has many species of fish as it is fed indirectly by the Mad River. You can fish from a boat or from the shoreline. (Please contact a wildlife biologist if you catch an exotic fish. We want to keep our species native, and an exotic could harm the natural ecosystem). An Ohio fishing license is required to fish at Eastwood Lake and at Mad River. If you prefer to fish by boat, canoes and kayaks are permitted on the lake every day. Fishing boats with wake are limited to even-numbered days; fishing boats with no wake on odd-numbered days. Dozens of fingerling saugeyes in the 12- to 14-inch range have been captured during wildlife surveys in the lake. Saugeyes fish provide excellent fishing in the spring and fall. Eastwood Lake also has a good population of large bluegills. After Christmas of 2018, we asked you to recycle your Christmas tree to be used as fish food at the bottom of Eastwood Lake. Thanks to nearly 700 of your donated trees, the underwater habitat will thrive in 2019. View a map of where the trees were dropped. Blue Lake and Eastwood Lake are remnants of gravel mining operations and are fed by the Mad River, providing excellent fishing throughout the year. Most of Blue Lake’s banks are lined with trees, so fishing from a hand-powered watercraft will be the most effective. The number and size of bass in the small deep lake make carrying a canoe or kayak from the nearby parking area well worth the effort. Follow the entrance road all the way to the very end and parallel park on the left next to the row of trees. Eastwood MetroPark’s 4349 Springfield St. entrance will take you right to the lagoon for some great fishing. Other options are to fish from the shoreline along the stone retaining wall, from the boat docks or from a paddleboard, kayak or canoe. Islands connected by arching stone bridges allow you to walk to most of the fishing spots. Because the lagoon is fed by the Mad River, you’re likely to catch bluegills, crappies, largemouth and smallmouth bass, rock bass, carp and catfish. Riffles, runs and pools are the perfect habitat for fish, and the RiverScape River Run on the Great Miami River has all of these features and more. The work to transform the low dam between I-75 and Monument Avenue is nearly complete. When finished, it will create excellent fishing and a great recreation spot for many types of users. The Great Miami is a perfect warm-water species fishery, with smallmouth and largemouth bass, panfish and catfish. The best place in MetroParks for trophy largemouth bass are the ponds in the north part of Englewood MetroPark. Fishing surveys found numerous bass weighing more than 6 lbs. Martindale Road Pond is the best location to catch a large number of crappies. North Park fishing ponds open 24/7 Apr. 1 – Oct. 31. for fishing only. The lake on Martindale Road is open 24/7 year-round for fishing only. The Mad River is a haven for smallmouth and largemouth bass, rock bass, crappies, bluegills, carp and suckers—as well as the occasional trout in the winter, in some of the deeper holes. This is a wade-and-fish location, especially for fly anglers. Wading makes the productive holes along the banks easier to cast into without spooking the fish. The new Mad River Run at Eastwood has created deep water holes, where fish tend to concentrate to stay out of the river current as well as over-winter. It’s a place for anglers to catch fish pooled above and below the run and the calm waters enables fly anglers to hone their skills. *These parks have areas where you may fish without a state fishing license. Visit park information for specific locations. Our rivers and creeks offer prime fishing spots. Fishing licenses are required to take fish from all Ohio waters except ponds and reservoirs on private property from which fish do not migrate (see parks listed above). Anglers must carry their license with them when fishing. Licenses, which can be purchased online from the Ohio Department of Natural Resources, are available for residents and nonresidents and range from one-day to annual permits. Download the Great Miami River Water Trail Map. Download Stillwater River Water Trail Map. Download Mad River Water Trail Map. Let’s not assume you can’t go fishing because you don’t know how to fish. Fishing is something everyone can do and learning to fish is the best part — and easier than you think! Fishing is not a dangerous sport, but you should prepare to keep safe in the outdoors. • Have a life jacket for everyone fishing. • Bring a first-aid kit for cuts or scrapes. Nymphs, Emergers, Dries — Oh My! Don’t discard fishing supplies. Take them with you or dispose of them properly. Replace used and worn-out line before it becomes a problem. Recover as much line as you can when it gets snagged on trees and rocks. If you see old line on the shore or in the water, grab it and put it in one of our outdoor collection bins. 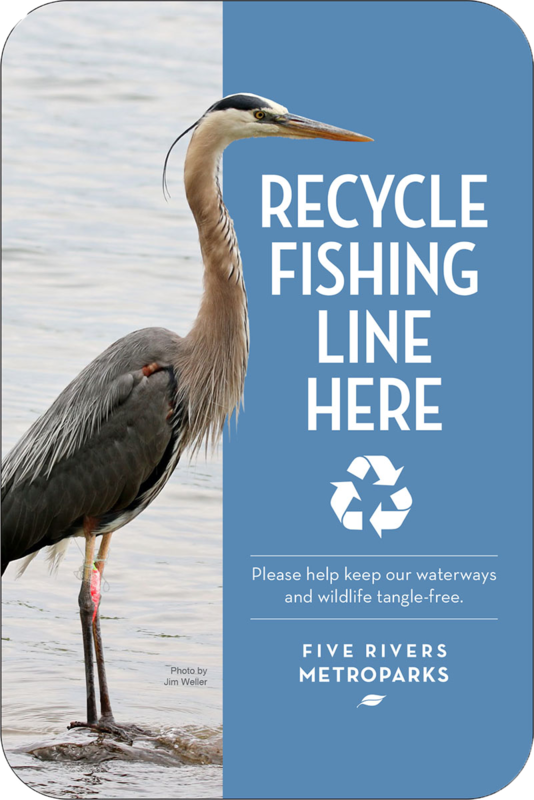 Volunteer to maintain a Five Rivers collection bin at a Five Rivers MetroPark location near you.